France just spent €5M ($5.2M USD) to "pave" a 1 km stretch of road with Wattway solar panels. The highway is in the northern village of Tourouvre-au-Perche, where authorities claim that the electric avenue will generate up to 800 kWh of energy every day, which they hope will be enough to power the village's streetlights. Is this a bright idea? I don't know … let's do the math. 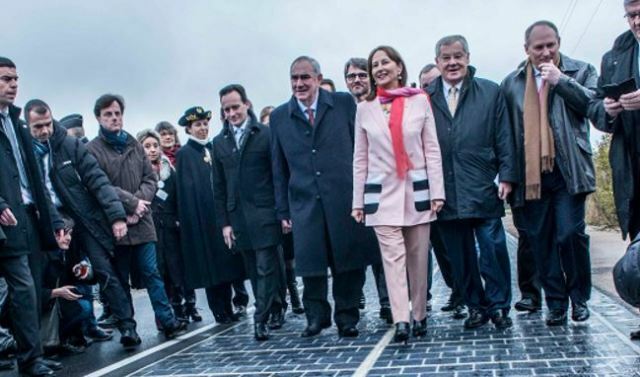 Ségolène Royal, Minister of Environment, Energy, and Sea, inaugurates the Solar Roadway. The roadway's 420kW photovoltaic array consists of 2800 square meters of Wattway solar tiles, specially formulated polycrystalline PV cells with a durable coating that allows them to withstand the rigors of traffic. Polycrystalline cells are less efficient than monocrystalline silicon. Wattway cells come in at around 15% efficient; monocrystalline rooftop PV panels are about 20% efficient. The Colas Group, developer of the Wattway, claims that roads are about 10% occupied. (I assume they mean that any given tile would be shaded by traffic one-tenth of the time.) So right there the array loses roughly ten percent of its available power. Now let's consider the tilt angle. Ideally, PV panels should face directly toward the sun for maximum solar exposure. The rule of thumb for overall annual production is to tilt the array at the latitude angle. Since roadway tiles lie flat, they'll gather less solar power than they would if properly tilted. I ran some ballpark calculations using PVWatts and found that the difference in tilt angle results in a 12.5% drop in energy production. Factor in the 10% loss caused by traffic shading and the solar road will generate 20% less power than an equivalent sized conventional solar array. Those numbers don't even include the potential loss due to dirt on the surface of the panels. When I estimated that 10% shading would result in a 10% loss of energy, I was being optimistic. Depending on how the cells are connected (and Colas is not releasing that information), it could be much worse, since a small shaded area can cause a drastic decrease in current and power output. (See this article for an explanation of power loss due to partial shading.) I'll give them the benefit of the doubt and assume that they include an abundance of bypass diodes, DC optimizers, and/or microinverters, making the 10% loss a reasonable estimate. However, I'm wondering about how the circuitry will respond to repeated current surges caused by quick variations between sun and shade. Abrupt changes in current tend to shorten the life of electronic hardware, which would increase the long-term cost of maintaining the road. I'm a big proponent of solar power … where it makes sense. Frankly, solar roadways appear to be more gimmick than substance. It would be less costly to simply put regular solar panels along the medians of roads, where they can be ground-mounted, optimally-tilted, unshaded by vehicles, and relatively clean. For one-fourth the price, off-road PV arrays would generate more electricity using standard components. And if they just want to power the roadway luminaires, consider solar-powered streetlights. Over the next five years, the French government hopes to install 1000 km of solar roads. In this engineer's opinion, they would be wise to wait until they see the results of this experiment before truckin' down that boulevard.